Wellington FL, Winter 2019 - Awarded scores to 71% for the Grand Prix and Special at National shows as well as in CDI's showing alongside seasoned WEG and Olympic competitors om Wellington FL, Farrington is an up and coming talent with clear international potential. Super character, paces and work ethic! Disposition suitable for an amateur as well as professional rider. Simply wonderful horse, offered for sale by private treaty. Wellington FL, March 2019 - Lightly shown and just beginning her FEI career, we are thrilled that Geneval was awarded 70% for the GPS at her first major competition. This lovely mare is a glorious girl with outstanding gaits, talents and disposition. Offered for sale by private treaty. Mill Spring, NC, Sept. 2018 - Our newest superstar, 8 year old KWPN gelding Farrington, was just awarded the Open Grand Prix championship for the Pinehurst NC competition series. In his first year at Grand Prix, this talented young horse has received scores up to 68% for GP and 65% for his first GP Special last weekend. Lightly shown and still learning the ropes, Farrington gets 7's and 8's for his piaffe and passage with lots of score upside as he gains experience. Has already qualified for his USDF Horse Award at Grand Prix. Mill Spring, NC, Early 2018 - Let the games begin! 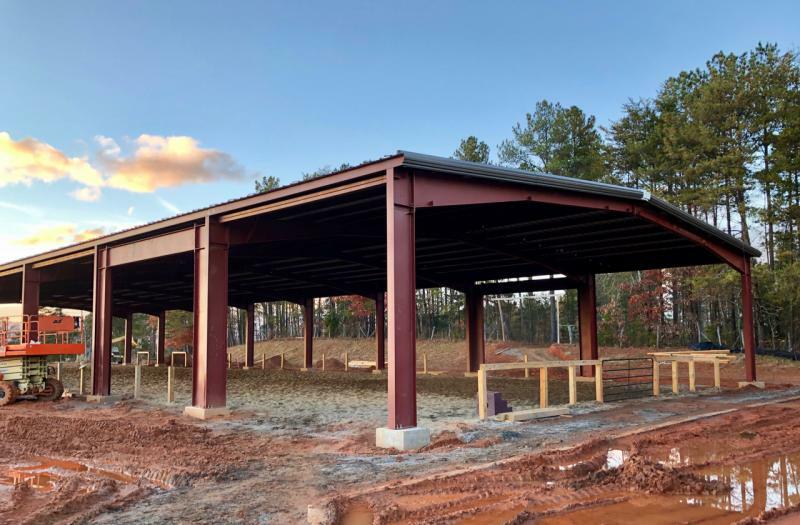 Sitework for the new barn and arena got going right before Christmas, and we have had a flurry of activity since we arrived in February. 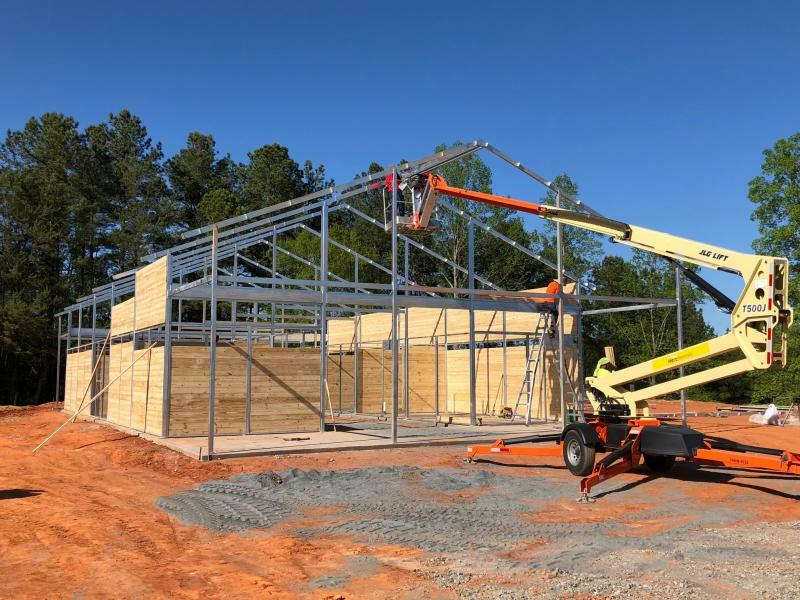 As Michael says, "No small projects - just small people!" 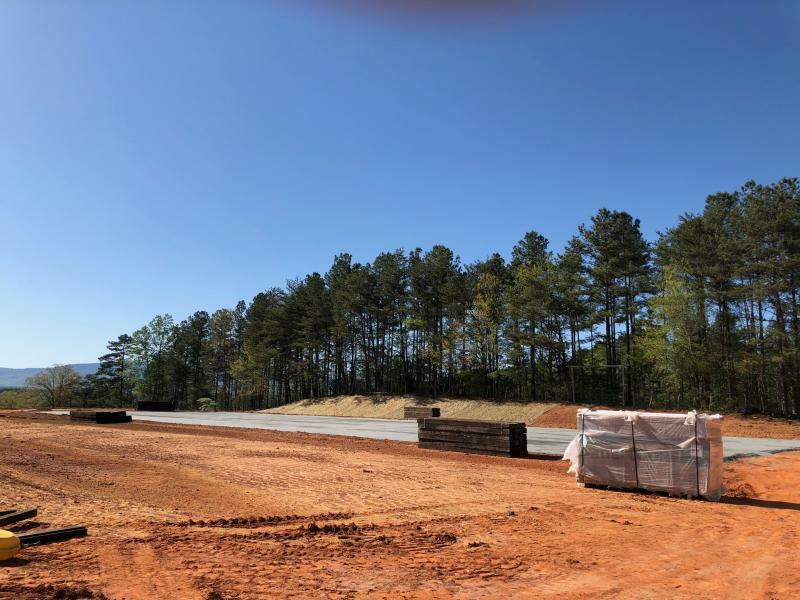 We are excited to get things established and bring the horses (not just the wild turkeys) home to roost. 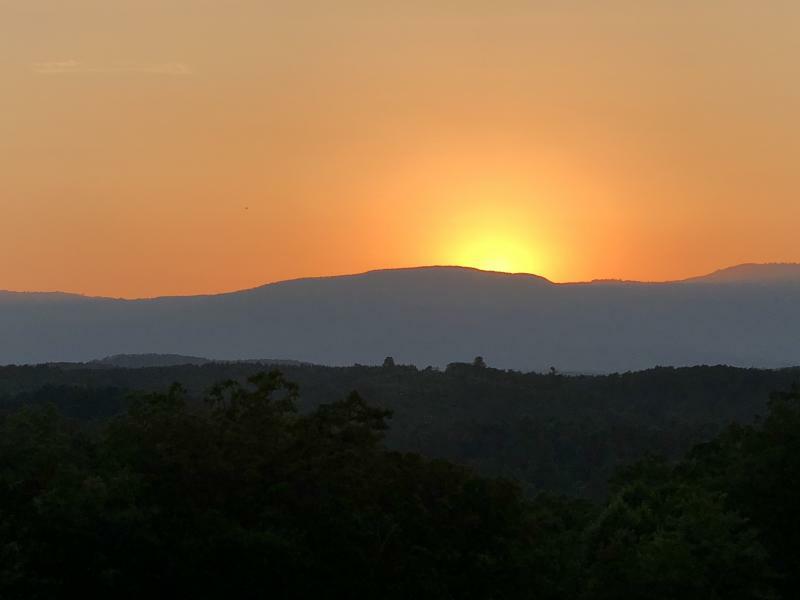 Watsonville, CA and Mill Spring, NC - With many youngsters approaching a good training level and age to be sold, we have decided that making the trek from CA to FL every year with some but not all of our horses no longer makes sense. 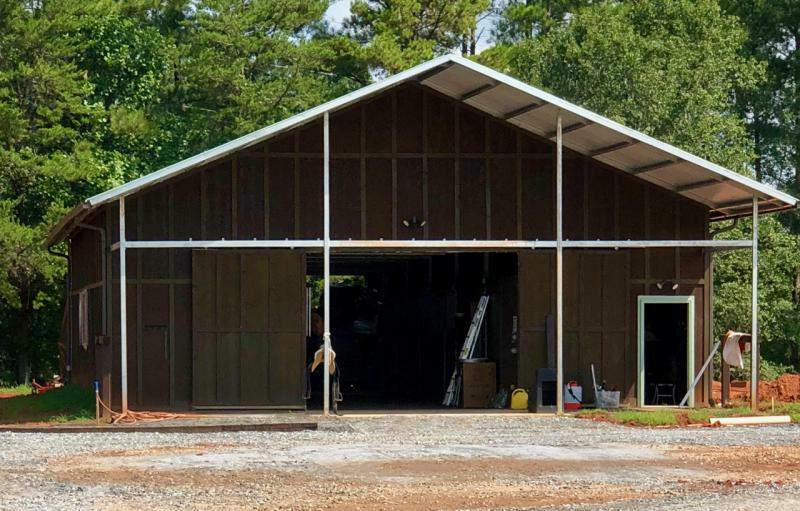 So we are excited to announce that we've bought a new property less than 5 miles from the Tryon International Equestrian Center in Mill Spring, NC and will be permanently relocating there. After 22 years at High School Farm, this will be a major undertaking, and we will miss all of our friends in the Bay Area. But what a good reason to visit TIEC! Watsonville, CA, Fall 2017 - We are delighted that our young Hero has found a new home with a wonderful amateur rider and great coach! This winning combination will assuredly help this sweet and talented gelding to come up the levels with much fun in the process. Watsonville, CA, Dec. 2016 - What a thrill it was to open that letter from USDF and learn that Walkabout was awarded the Grand Prix All-Breeds Horse of the Year award! 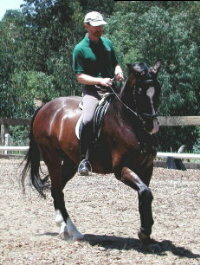 Walkabout was purchased as a foal at 5 months, and Mike started and brought him up through the levels all of the way. Thanks to the team who helped make it happen: Louise, Bill, Mike & Vera, Sonja, David Hunt and the others who know who you are. Your support and encouragement really made the difference. Watsonville, CA, 2016. At 7 years old and ready to launch his FEI and Grand Prix career, Mike and his Dutch partner have taken G-man back to Europe for a new competition home outside of Paris. Started by Mike as a gangly youngster, G-man has matured into an impressive dressage partner with a beautiful piaffe, passage and pirouetes and expressive flying changes. Bon chance to this great horse in his new country. Wellington, FL & Watsonville, CA. With a dozen horses in the barn, clients in training, youngsers cutting their teeth at schooling shows, and a solid competition season in Wellington, 2016 was very busy! Highlights are on our Facebook page, but we were thrilled that Mike and Walkabout started scoring in the 70's for the GP Special in a very tough competitive environment. We got Walkabout at 5 months, so he's come a long way. Wellington, FL, March, 2015. Or should we say Weltauna gets HER USDF Gold medal award? Suppose it depends who you ask! Thanks to uber coach and spouse, Michael Pineo, for showing Louise how to put a halter on at age 40 and what to do after that, as well as to David Hunt and Michael and Vera Barisone for their ongoing support. An adult amateur's dream come true. Wellington, FL, March, 2015. Delighted to announce that the Debbie and Bob McDonald have purchased Ukiah as a new international prospect. Acquired in Germany as a foal and started and trained by Mike, Ukiah can perform all of the Grand Prix movements with ease and fluidity, and he loves his job. We wish them the best of success with this very special horse. Wellington, FL, Feb. 2015. With six horses in Florida this year including 3 sales prospects, it's been a busy season! 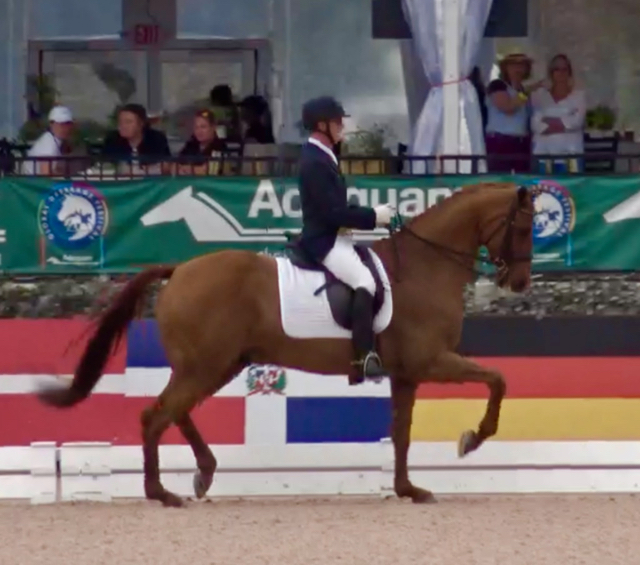 Not too busy for Mike and Walkie to deliver 67.2% and 68.2% on Grand Prix rides among a distingushed roster of national and interntional competitors at the Global Dressage Festival last weekend. Topped by 70% plus for the Grand Prix Special. Good going, boys! 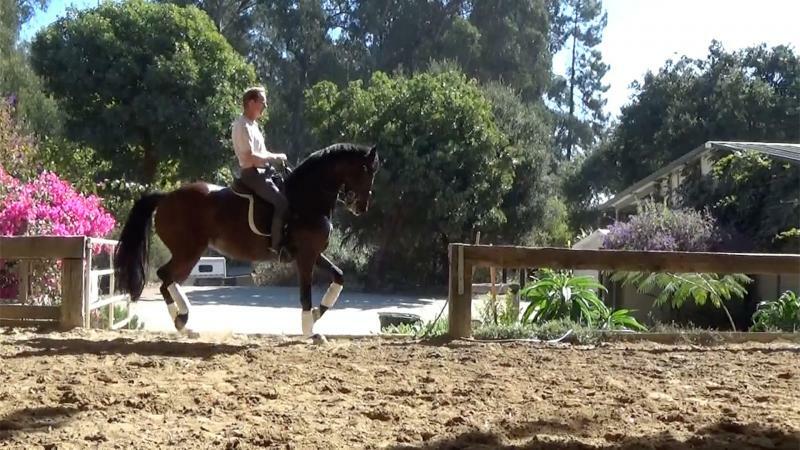 Watsonville, CA, October, 2014 -- A quick trip back to Holland to find young prospects with the promise of FEI talent has yielded a 4 year-old Jazz x Samba Hit gelding for the TAG investment group. 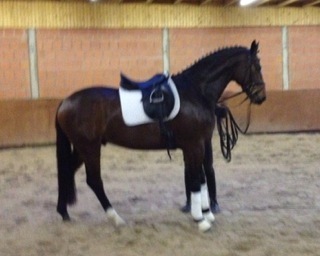 He is a very nice dressage type, and will be an equally nice sales prospect once he gets more training under his belt. Watsonville, CA, Sept. 2014 -- While in Europe to see the WEG, we took the opportunity to visit Mike's horses in Holland. All are doing well, and the lovely Geneva (2011 Sir Donnerhall x Olivi mare) will be shipping to the US on the 8th. She is a super mover, and Mike is really looking forward to starting her training. Definitely more to come about this lovely girl. 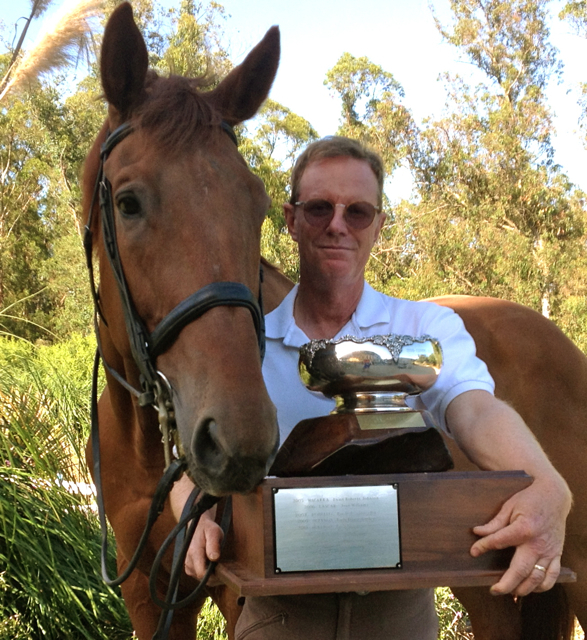 47th Annual San Francisco Peninsula Dressage Show, June 9, 2014: Mike and Walkabout awarded the Kadett Memorial Trophy for the highest point FEI ride. First awarded to Hilda Gurney and Keen in 1972, this perpetual trophy has also been won by Califorinia dressage notables including Rachel Saavedra, Lynn Roberts-Johnson, Sandy Howard and others who are great company for our duo to share. Go Walkie! Watsonville, CA, May 2014 -- The first of Mike's 3 new horses from Holland has arrived in the US: "G-man", a 2011 UB40 / Krack C gelding. 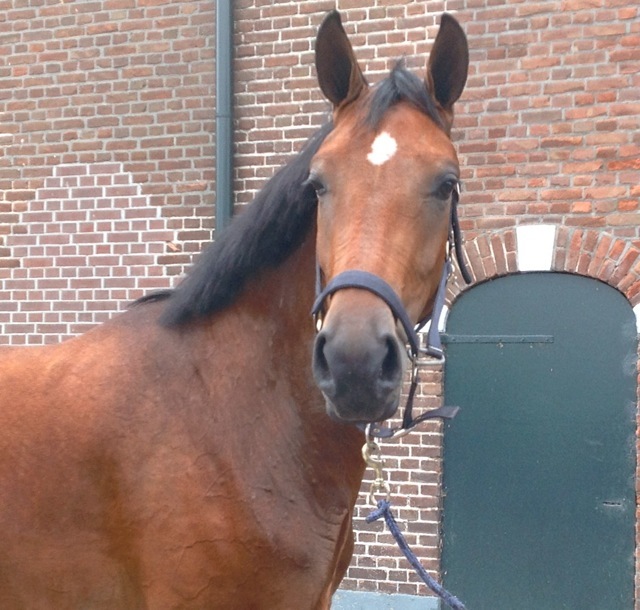 "Geneva", a 2011 Sir Donnerhall / Olivi mare will arrive this summer, followed by the yearling filly, "Irina", next spring. Once firmly under saddle, the 3 year olds will be offered for sale in partnership with a top Dutch breeder / dealer. Stay tuned to our Sales Page to see them in upcoming months. Wellington, FL, April 2014 -- Too much going on this season to track! Walkabout's show record continued to build with wins and solid scores in Wellington. Thanks to Michael Barisone for great coaching and support. Walkie will do a few more National shows in California, and make his CDI debut next winter on the Wellington circuit. Wellington, FL, March, 2014 -- It was a wonderful happenstance that Adonis's new owner came to Wellington to purchase an FEI dressage prospect and found Regatta. The pair looks super, and best wishes for Jackie to fulfill her dreams with this horse. Wellington, FL, January, 2014 -- The lovely "Bobby" attracted the attention of another student of Michael Barsione's, who promptly purchased him shortly after we arrived in Wellington. Also from New Jersey, the new owner is a regular in the Barisone's group, so it will be a pleasure for us to see the horse continue to develop. Best of luck to Jovanna! Watsonville, CA, September 24, 2013 -- Congratulations to Jackie on her purchase of Adonis! She is going to have a lot of fun with this special boy. Watsonville, CA, September 24, 2013 -- Mike is pleased to accept an appointment as California Regional Director of the US PRE Breeders' Association. Since owning the Grand Prix stallion, Astro, Mike has enjoyed a special affinity for these horses and their wonderful dispositions and rideability. He looks forward to working with the West Coast PRE breeders and assisting the USPREBA to achieve its mission. For more information about the organization, visit www.USPREBA.com. Watsonville, CA, May 23, 2013 -- We are excited that the 2010 geldings Danseur and Ukiah made the trip from Germany and to our barn without a hitch. They were started under saddle in Germany at the Hanoverian State Stud, where they made it to the final round Celle's own stallion selection, and imported from Wintermuhle Sporthose, who is our partner with Danseur. So now the fun begins! Watsonville, CA, May 19, 2013 -- Walkabout continues his success performing the Grand Prix with Mike, turning in a score of 65% at the Woodside Spring Fling dressage show this weekend. He will continue to show in California this summer before returning to the Florida circuit in the fall. Watsonville, CA, May 19, 2013 -- The Woodside show also marked a milestone for Louise and Weltauna, who landed their second qualifying score at Intermediare I. The pair will focus on schooling the Grand Prix movements with a goal to show at that level later this year. 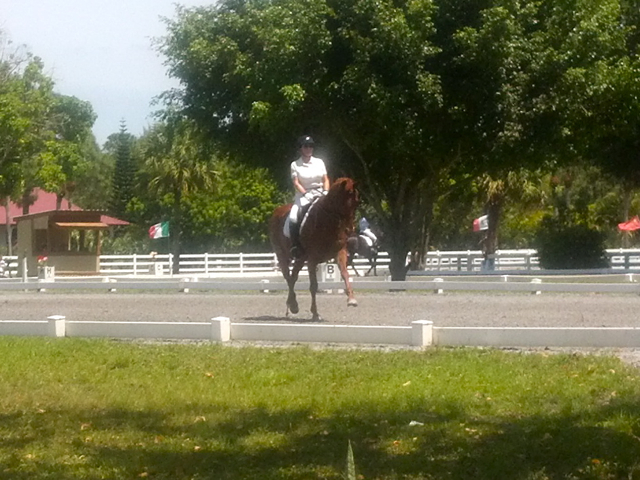 WELLINGTON, FL, APRIL 4, 2013 -- Congratulations to Elise on her purchase of Raconteur! He will make a great competitive partner and Grand Prix schoolmaster, and we wish them both the best of luck! WELLINGTON, FL, March 23, 2013. W﻿alkabout is back in the show ring and won his second Grand Prix test of the year with a convincint 69.9%, outperforming a distinguished field of mostly professional national and international riders. This was really Walkie's day, and we look forward to giving him more ring experience with the goal of breaking the 70% barrier and then advancing to CDIs. 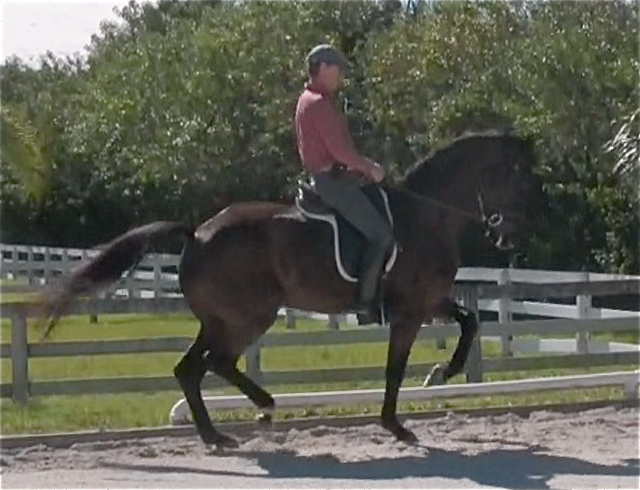 WELLINGTON, FL, March 1, 2013 -- We're excited to announce the purchase of 2 additional high quality Hanoverian 3 year-old geldings: Dancier x Wolkentanz, which is co-owned with Pferdesport Wintermuehle (to be named Danseur), and Ucello x Provider, who comes from jumping / dressage bloodlines (to be named Ukiah). Both horses were selected directly from the Hanoverian Celle State Stud in Wahrendorf, and were in the the final group of a dozen or so 2.5 year-olds from which the State Stud chose their 2013 stallions to keep at Celle for breeding. We selected these 2 horses for their absolutely top bloodlines, movement, suitability for dressage and looks. The horses have since been gelded and will stay at Pherdesport Wintermeuhle's stable in Berlin until the end of April for development. 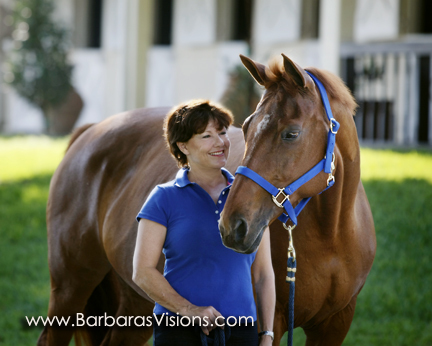 Is 2013 "The Year of the Adult Amateur" in Dressage? 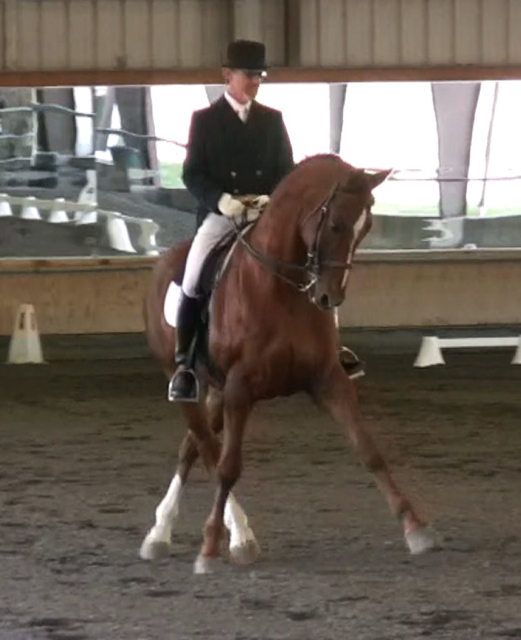 Check out http://blog.centerlinescores.com/2013/02/dressage-trends-part-3/﻿ for an interesting analysis. WELLINGTON, FL, Feb. 6, 2013 -- Mike took Raconteur and Walkabout out for their first shows this year and received solid scores on their Grand Prix Special rides. Raconteur achieved 66%, and it was great to see Walkabout back in the show ring! Regatta also visited the show, and was completely unfazed by all of the flags, other horses and riders, and general commotion. Hacked over by herself, did her thing, then hacked home. ﻿She is going to have a great future! WELLINGTON / VECHTA, Germay, January 2013. Mike has purchased an exciting 3 year-old by Bonifatius / Bellisimo M out of a Weltmeyer dam. Bon Vivant should be arriving in the US soon, with perhaps another couple of horses to follow. Very productive trip! WATSONVILLE November 15, 2012 -- High School Farm has been selected for the 2012 Best of Watsonville Award in the Animal Training Services category by the Watsonville Award Program. Each year, the Watsonville Award Program identifies companies that we believe have achieved exceptional marketing success in their local community and business category. These are local companies that enhance the positive image of small business through service to their customers and our community. These exceptional companies help make the Watsonville area a great place to live, work and play. Various sources of information were gathered and analyzed to choose the winners in each category. The 2012 Watsonville Award Program focuses on quality, not quantity. Winners are determined based on the information gathered both internally by the Watsonville Award Program and data provided by third parties. The Watsonville Award Program is an annual awards program honoring the achievements and accomplishments of local businesses throughout the Watsonville area. Recognition is given to those companies that have shown the ability to use their best practices and implemented programs to generate competitive advantages and long-term value. The Watsonville Award Program was established to recognize the best of local businesses in our community. Our organization works exclusively with local business owners, trade groups, professional associations and other business advertising and marketing groups. Our mission is to recognize the small business community’s contributions to the U.S. economy. October 23, 2012. Adonis is a 1998 Swedish warmblood gelding who can do it all and would be a great 4th level schoolmaster - who can also do piaffe, passage and pirouettes! At 15.3hh, he is perfect for an adult amateur or Brentina Cup hopeful. Adonis is reasonably priced because we'd like to sell him this fall before Mike goes to Florida for the season. Always sound; updated x-rays available. This is a great opportunity to purchase a great horse for a great price. See new video of a clinic at the end of last month with David Hunt in our Sales Barn. October 23, 2012. Regatta is a 16.2hh 2007 black bay Hanoverian mare by Regazzoni. With 3 good gaits, a solid work ethic, and a fantastic disposition, this mare has a lot to offer both the amateur and the professional. She is coming along nicely in her taining, is very elastic, has mastered her lateral work, does flying changes, and already offers piaffe and passage. To learn more about this mare's potential, visit the Sales Barn. October 10, 2012. Our gorgeous mare, Devinee, has been purchased and will make her new home at Sasha Newman's barn in Wellington, FL. She will make a fantastic Grand Prix partner for this seasoned competitor. We wish this pair all of the best! June 17, 2012. Despite blistering temperatures in excess of 105 degrees, Mike received 3 solid scores riding the Grand Prix Special at the Golden State Dressage Classic in Sacramento, culminating with 67.44% from Judge Jane Ayers. Her comments: "Solidly correct test. A pleasure to see. Good harmony between horse and rider." Video of their latest ride will be available on the website soon. June 2, 2012. Back in the show ring in California at Sonoma CDS's Shelly Siegel show. Mike and Raconteur continue to build on their successful Grand Prix show record receiving 64.78% from British International Judge Sandy Phillips, who is a member of the selection panel for her country for the upcoming London Olympics. An excellent result! April, 2012. What an experience in Wellington! Horses, horses everywhere, every day. Top riders on top horses with top coaches from all over the world competing for some serious CDI prize money made for some serious dressage competition, even at "local" national shows. We were very lucky to receive coaching to "up" our show skills from Michael and Vera Barisone, and Mike also received feedback and encouragement from Kathy Connelly and Robert Dover. No wonder that it was gratifying to end the winter season with solid wins in the mid-60's at our last Florida show: Mike and Raconteur in the Grand Prix and Louise with Weltauna riding PSG. Looking forward to a great summer back home! Feb., 2012. After way too much "encouragement," we have established a social media presence. On Facebook, Mike is Michael Pineo Dressage and Louise is simply Louise Smith. 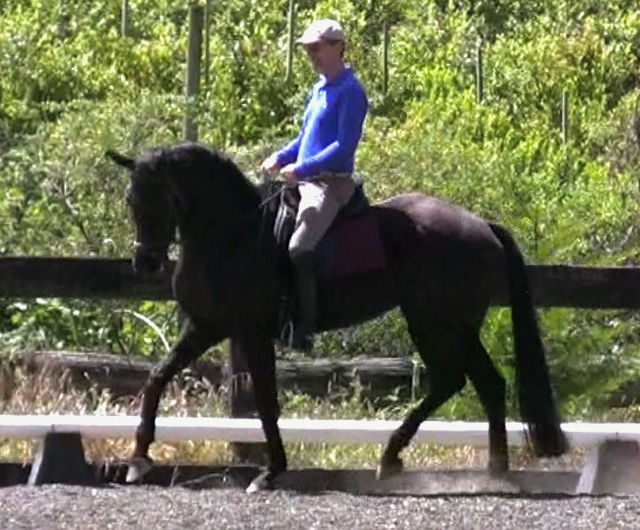 (Go figure...) A blog is in progress to capture this DressageDuo's bi-coastal adventures Follow us if you dare! December, 2011. "Mike's best student" has met her goal of earning her silver dressage rider award (4th level - PSG) early in the season, garnering her final PSG qualifying rider award score at her first show in Florida. With Weltauna new to this level, the pair are looking forward to moving their scores up at PSG and beginning to tackle Intermediare. High School Farm Horses to Strut Their Stuff in Wellington. November, 2011. Mike, Louise and four of our horses (Raconteur - GP, Walkabout - GP, Weltauna - PSG and Devinee - FEI prospect) are heading back to Florida to compete on the Wellington winter dressage circuit. Contact Mike for information about High School Farm's winter operations in California. High School Farm Horses Have Success at Yarra Yarra August Dressage Show. August, 2011. High School Farm's horses performed well at the Yarra Yarra dressage in Pleasanton, CA with judges Sonja Vracko and Sue Curry Shaffer. Raconteur and Mike topped 72% for their GP and GPS tests with Sonja and received 65%+ from Sue. Walkabout received 70%+ for his GP test with Mike aboard, and Louise received a qualifying score on her first PSG outing riding Weltauna. See video of Mike and Raconteur doing a GPS test on the Sales Barn page. May, 2011. With two 9's on piaffe, 8's on passage, piaffe-passage-transitions and the canter pirouettes, Mike and Raconteur took the high point for their Grand Prix ride at the Dressage at Hossmore show. Judge Sonja Vracko's comments: "Well ridden. Pleasure to watch." May, 2011. Adonis and Mike also had an excellent show at Hossmore, scoring 67.14% where he was competed at 4th level to gain more ring experience. Adonis is highly confirmed in piaffe, passage and pirouettes, and is schooling 1-tempi changes so he will be advanced to PSG/Intermediare. Louise and Weltauna received their best ever 4th level score of 66.22%. With ample 4th level qualifying scores, Louise needs one more PSG score to qualify for her USDF Silver Medal. Stay tuned for more. Diamo Sold to Canadian Rider. April, 2011. Diamo will soon be exported to Ontario, Canada, where he and his new owner have great plans, perhaps including a run at representing their country in upcoming international competitions. We wish them both the best! Raconteur Makes Grand Prix Debut. April, 2011. After a successful clinic with David Hunt in March, Raconteur made his Grand Prix debut in Santa Barbara this month. Judge Hilda Gurney complimented Raconteur on his fantastic piaffe, and he will continue to be shown this year to build his record at this level. Fleur Purchased by 1st Level Amateur from Los Angeles. February, 2011. Fleur is off to her new home in sunny Southern California. Purchased by an adult amateur after being recommended by her dressage trainer, this lovely mare has a wonderful future in front of her. With winning bloodlines, perhaps she will even experience motherhood some day! Watachie Tachie - Off to the Napa Wine Country! January, 2010. Watachie Tachie has found a wonderful new home in the glorious Napa wine country with an advanced dressage rider who is thrilled to acquire this beautiful and talented horse. Best to both Nicole and "Tachie" as they build their partnership. We hope to see them showing at FEI soon! Fleur & Diamo Win Rave Reviews at Carmel Valley Dressage Show. November, 2009. To build ring experience, Fleur and Diamo wow'd the crowd with their character, looks and movement at Carmel Valley CDS's show on Sunday Nov. 8th. 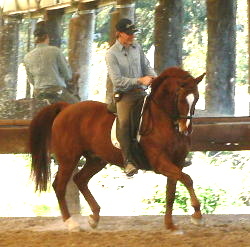 Both horses scored nicely in the 60's, and behaved like seasoned pro's in the open warm-up and arena. Competitors and spectators alike deemed Diamo to be "fabulous" and "absolutely stunning," and the Judge agreed by commenting "lovely and capable horse." Fleur charmed the crowd as well on one of her first trips away from the farm, with the Judge commenting that she, too, is a "lovely" girl and "shows promise." Both horses clearly have super careers in front of them! For more information about Fleur and Diamo, go to our Sales Barn page. 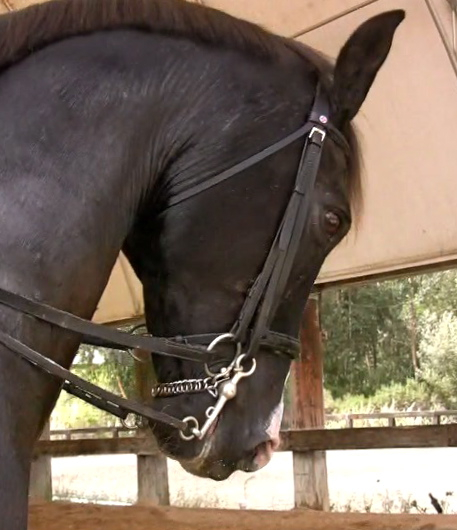 Meet Fleur: The Perfect Amateur Horse. October, 2009. To meet the needs of riders looking for a quality horse to start at training level and progress nicely, High School Farm has added the black/bay 2004 Hanoverian mare, Fleur du Lune, to our sales barn. Fleur has a fantastic sweet disposition, is easy to sit and fun to ride, and has proven to be super trainable. She is currently schooling Training / 1st level with nice jump in the canter and shoulder-in, leg yields. We seldom offer such a promising horse so early in its training, so come and meet her soon. Diamo Receives Excellent Evaluation at David Hunt Clinic. September, 2009. Diamo was presented with very positive feedback at a clinic with David Hunt, head of the International Dressage Trainers' Club. The clinician remarked that the horse has all of the pieces coming together to be a fine Grand Prix horse. Video excerpts can be seen via Diamo's "stall" on the Sales Barn page, as well as on the HorsesDaily sales website. More FEI Horses & Youngsters Now Available. August, 2009. High School Farm has added 3 additional FEI prospects to its Sales Barn: Hamilton (1994 KWPN / SWE gelding), a spectacular and very special horse that defines the term "flashy," Adonis (1998 SWE gelding), talented son of the world famous Amiral, and the lovely Regatta (2007 Hann. filly by Regazzoni/Diamont). Please contact us if you would like to arrange a visit to meet these and other up-and-coming horses at High School Farm. High School Farm Presents FEI / GP Horses for Sale. May, 2009. High School Farm is pleased to offer 4 trained FEI-level horses for sale: Diamo (2001 Berlin Brandenburg gelding imported for training by Hesselhof Premium Dressage in Wahrendorf - FEI prospect), Raconteur (1998 imported Dutch gelding - confirmed GP), Watachie Tachie (2001 imported Oldenburg gelding - International FEI prospect), and Zephyrs (1997 Dutch-cross stallion who made his GP debut in 2008). Please go to our Sales Barn page for more information about these outstanding prospects. Weltauna Awarded Premium Status as High Point Oldenburg Inspection Winner. September, 2008. Weltauna, High School Farm's 9 year old Weltmeyer granddaugher, has received the coveted "premium mare" status at the Oldenburg mare inspection at Rainbow Equus Meadows on September 9th. Only 2 percent of all Oldenburg mares receive scores over 105 points to be awarded premium status. With the exceptional high point score of 108 points, Weltauna was the clear winner besting her two closest competitors out of a large field of mares by 3 points. After noting her beautiful head, strong conformation elements, and outstanding movement, the judge remarked that "this is a really good mare!" We agree! More information is available about Weltauna on our Other Horses page. Zephyrus Makes Grand Prix Debut. August, 2008. After coming to High School Farm as an unstarted 7 year old stallion, Zephyrus made his Grand Prix debut at the Coastal Classic I-II, a pair of 3-star USDF recognized dressage shows. Zephyrus (barn name "Ari") has previously been lightly shown at Prix St. George and Intermediare, where he received over 70%. In the Grand Prix, where the horse got comfortable with his new surroundings, Zephyrus received 8's on the trot half pass and piaffe as well as numerous 7's with the judge's comment, "a lot of power there." The next day, he received 64.8% in his first Grand Prix Special. Ari's owner, Kathyrn Conley, was thrilled as she hopes to gain breed licensing for her 11 year old stallion through competition scores. This horse is currently for sale, and can be gelded as a courtesy to his buyer if so desired. For more information, please contact Mike. Nov. 2007. 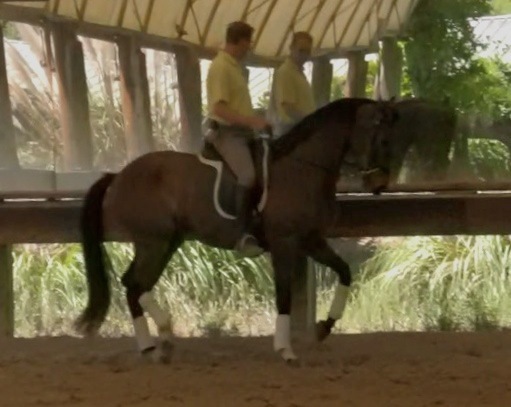 In a training agreement with Hesselhof, Mike has brought a promising German Berlin-Brandenburg gelding to California for upper level dressage training and eventual sale as an FEI horse in Europe or the United States. "Diamo," a 6-year old liver chestnut with top level Westfalen bloodlines, is settling in nicely to start his training at High School Farm. 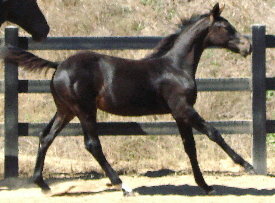 See our Sales Barn page to link to video of this promising youngster in development. DeRigueur Sold to German Grand Prix Rider. January, 2007. 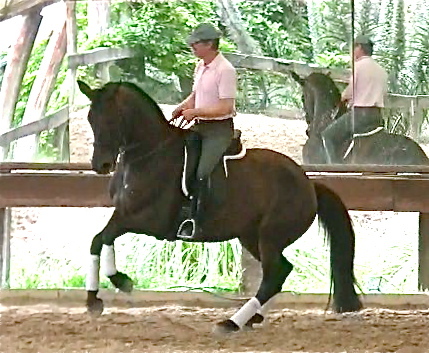 After being purchased by Ralph-Michael Rash, who was in charge of the German Bereiter liscensing program for 11 years and currently owns the well-known Hesselhof Premium Dressage farm near Warendorf, DeRigueur was privately sold to a Grand Prix rider in Germany with plans to introduce the horse to the International Grand Prix scene. DeRigueur can also be seen on the FEI page on this website. Mike Awarded USDF Gold Medal Rider Award. 2007. 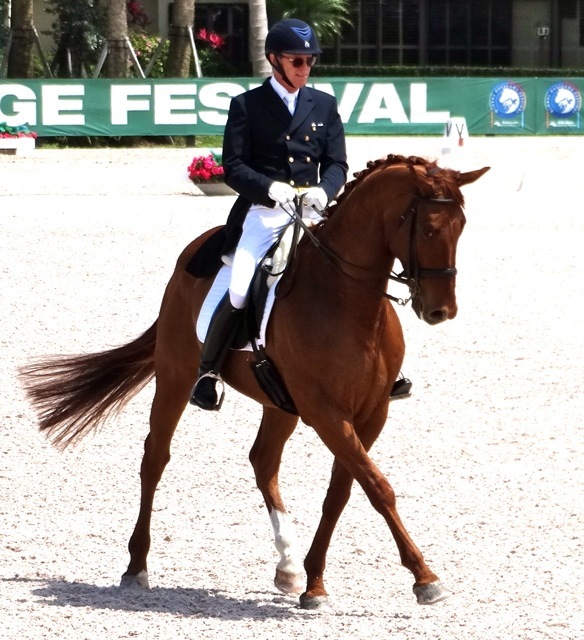 After receiving required competition scores at Intermediare and Grand Prix on multiple horses through 2006, Mike was awarded his USDF Gold medal, the highest rider award given by the United States Dressage Federation. More information is available on the USDF website. Join us in welcoming "Regatta," High School Farm's 2007 black Hanoverian filly by Regazzoni out of Shakespeare Farm's champion mare, Pointe Noire. With a charming, friendly disposition, she already loves people, attention and, of course, treats! With these looks, bloodlines and personality, we expect great things from Regatta when she grows up. And the Winner is.... Walkabout!